Simply put, In the Mood for Love might be the most visually beautiful film I’ve ever seen. At very least it is on the short list. 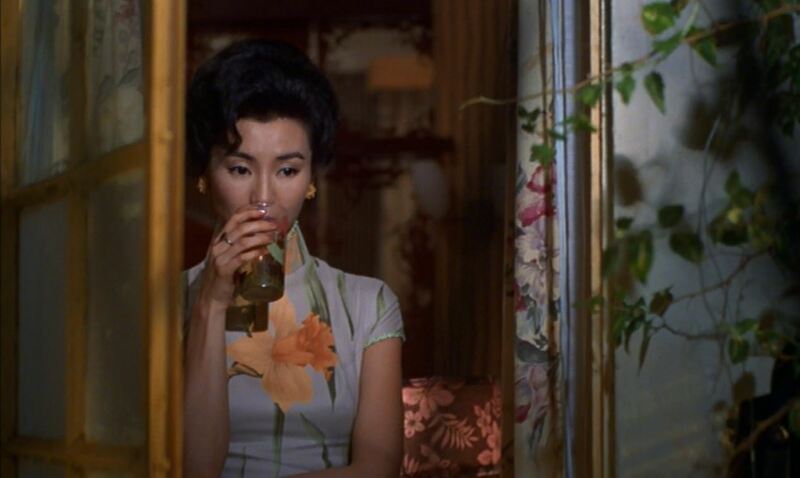 Set in Hong Kong in the 1960s, this film about a love affair (and possibly two) is itself a love note to the visual style of that era, especially its textiles. Every frame of the picture could be screencapped, printed, and hung on a wall. Add to it one of the most evocative and well-utilized musical scores in all of cinema and you have a film that provides an absolute sensory feast for its viewers. Wong Kar-Wai’s masterpiece tells the story of two people in Hong Kong in 1962. A man, Chow Mo-wan (Tony Leung), and a woman, Su Li-zhen (Maggie Cheung), rent rooms in adjoining apartments. They discover over time their spouses, frequent travelers we never see on screen, are having an affair. They embark on a relationship that is hard to define. They begin meeting to discuss what they know. They take comfort in the pain they share, and forge an uneasy friendship. It is clear they have feelings for each other, though it is unclear whether these are organic or are born out of their shared emotional need. They play detective, trying to figure out how their spouses’ affair started, what the first conversations must have been like. They playact their partners’ betrayals. They play act confronting them. They never indulge their attraction, either emotionally or physically. Their union was born from the shared pain of infidelity, and even though they could be so easily forgiven for taking solace in a fling (or more) of their own, they refuse to commit the same wrongs that were done to them. It is a heartbreaking choice, both for the couple and the viewer. The movie puts forth some very simple questions, though far too elegantly to spell them out: Are they right? Is honor the most important thing, or is life too short to deny happiness? Do they owe their erring spouses anything? Whatever the answers, choices are made on the side of constraint. They do nothing but yearn, and when they ultimately part, we can wonder if they regret this decision, though again we are shown nothing explicit to this end. So subtle is the film, so deft in its writing, direction, and acting we see only the feinting at flirtation, and only the whispers of its aftermath. These are enough. The film is flawless in the efficiency of its feeling while indulgent of the prolonged moment of its desire. It sits on the precipice of love, staring down at the wide vista below, and then steps back, turns away. The film’s visual motif echoes this dichotomy of constraint and indulgence. Vertical bars are regularly shadowed on our leads, and they are often tightly framed in booths, pressed into cars, trapped in rooms to avoid discovery. They are moving pictures of restraint. At the same time, Maggie Cheung’s wardrobe is about the most lovely thing I’ve ever seen, musical in its form and color. The home decor, restaurant color schemes, fashion, and automobiles are gorgeous, and of course, that devastating musical score thrumming and plucking under these visuals give voice to the beauty we imagine could exist for these two lonely people outside the rules they live by, and, maybe, there is beauty inside those rules as well. I can’t wait to share Wong Kar-Wai’s masterpiece as part of our Third Floor Film Series. Come join us on Thursday, September 24, at 7:00 p.m. as we screen this gorgeous movie. You can find out more details and updates for the event here. I look forward to seeing you there.